you home when you need it. You must have at least 6 months of driving experience in the last two years to be eligible for hire at Koch. By submitting this form you are opting in to receive correspondence from Koch Trucking. This includes receiving autodialed telephone calls, prerecorded messages and emails about trucking job opportunities at the contact numbers I have provided above. We're all about family. And we want you to spend time with yours so we do our best to get you plenty of home time. Our consistent routes mean you'll feel at home on roads you know. We’re celebrating 40 years of consistent growth and a stellar reputation among drivers and customers. Our motto is “Family Owned, Driver Focused,” and we want you to experience what that means! With top of the line pay, equipment, and fleet managers, you will FEEL the emphasis on our most important asset – YOU, the driver. 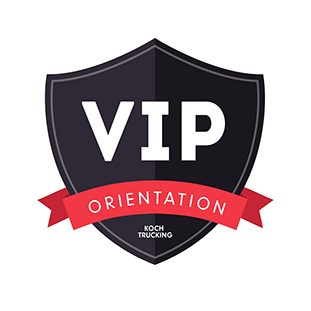 For starters, our VIP orientation is nothing but the best in housing, food, and a thorough introduction to what it means to represent Koch as a driver. Call a recruiter today to see how your best miles are ahead! Company drivers and owner-operators are both more than welcome to apply. No Tractor? No Problem! With our Lease Purchase program, you can get into a late-model tractor with no money down! Friends are priceless. But we'll pay you $3,000 to bring them to Koch! Consistent, accurate paychecks are as important to us as they are to you, which is why you'll get paychecks every Friday. Koch keeps you on the road when your truck is being repaired. We'll immediately take you to our nearest facility and put you in another rig while yours is in for repairs. That means no down time. You will always be driving and earning. APU-equipped late-model tractors with air-ride cabs and suspensions and 450 HP Cummins engines keep you comfortable on great lanes. Want to share time on the road with family? Bring them along! Our Rider Program welcomes all riders 12+ years of age. Driving safe is common sense and our incentive program is dollars and cents! Ask for details. We offer 24/7/365 road service assistance. We keep you rolling when your truck breaks down. Your time is money – VIP Orientation is paid! We’ll fly you to this 3-day event in Minneapolis where you’ll have your own accommodations in an upscale hotel and receive $100 cash when you arrive. At orientation you’ll learn everything you need to know to have the best Koch career. After orientation, we’ll put you on the road in a newly detailed, late-model truck, equipped with an APU and a power invertor, so that you are able to outfit your truck with some of the comforts of home. Koch has some of the best maintained trucks on the road! We do this to show our drivers we appreciate them and to welcome them to the Koch family. You're on social media and so are we! Follow us for up-to-the-minute information and to participate in our weekly contests. You'll find us on Facebook (@KochTrucking) and Instagram (@KochTrucking). We have routes and trucks for all types of hauls - OTR, Dedicated, Specialized and Flatbed. Start in one division and move to another if you'd like. There's plenty of room for all kinds of career growth at Koch. Stan Koch, our founder, purchased his first truck in 1978 and that means this year we'll be celebrating our 40th Anniversary. We hope you'll be here to help us make this year the best one yet - and for the year-long party! Koch was proud and honored to participate in the Special Olympics MN Truck Convey (2017). Thanks to our great drivers, we had 15 trucks with six Special Olympians in our passenger seats at this 2-day celebration, which helps raise money for Special Olympics Minnesota. New Koch Trucking Pet Policy! NO dogs in orientation. You may pick up your pet at your home once you’ve been assigned a truck.